ARDUINO Leonardo like board with ATMEGA32U4. 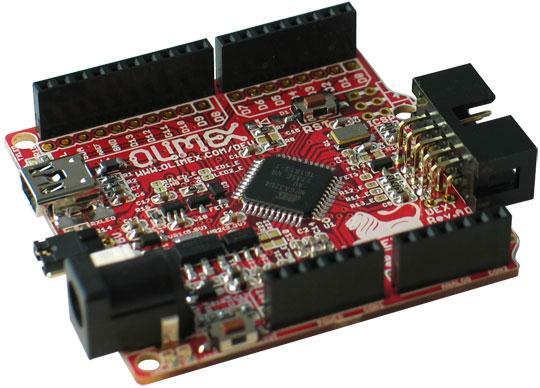 FEATURES: • ATMEGA32U4 microcontroller, all in one USB communication no need for external FTDI chip. • Input power supply 7-12VDC • ULTRA LOW POWER voltage regulators and the consumption is only few microamps, which enables handheld and battery powered applications. • Li-Ion rechargable battery power supply option with BUILD-IN on board charger, so when you attach battery it is automatically charged and kept in this state until the other power source (USB or external adapter) is removed and it AUTOMATICALLY will power the board - no jumpers, no switches! • work both on 3.3V and on 5V which is selectable with jumper, so 3.3V and 5V shields can be used • UEXT connector which allow many existing modules like RF, ZIGBEE, GSM, GPS to be connected • Allows RTC - Real Time Clock (Q1 can be replaced by RTC). • NOISE IMMUNE design • the LEDs and the BUTTONs are on the edge of the board so there is easy access even if the boards have shields on them • all components are LOWER than the connectors, so the shields do not interference with them • mini USB connector is used which is common and used in most cell phones, so you do not have to buy other cables • original design had flaw and the connectors were not spaced at 0.1" this make perfo board use impossible, to keep the compatibility we have same spacing but we add next to this connector on 0.1" which customer can use with perforated boards • all signals on the connectors are printed on top and on bottom of the board, so when you check with probe you know exactly which port you are measuring • 4 mount holes make board attachment easier FAQ: Q: I can't find compatible drivers in latest 1.0.1 Arduino IDE/drivers folder. What should I do? A: You have to program the board with the latest bootloader available. Q: I installed 1.0.0 version of Arduino IDE but I can't find Leonardo under boards A: Un-comment the Leonardo section in the "ardwarerduinooards.txt" file in your Arduino IDE install location Q: I disabled all interrupts and entered infinite loop code on my board and now the bootloader won't start. How do I start it? A: You need a programmer to program the bootloader again. Avoid disabling interrupts at all costs.